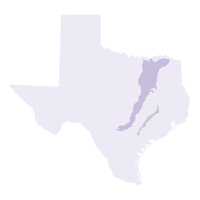 The Blackland Prairie ecoregion spans approximately 6.1 million hectares from the Red River on the north to near San Antonio in south Texas. It is part of a tallgrass prairie continuum that stretches from Manitoba to the Texas Coast.The Blackland Prairies is named for the deep, fertile black soils that characterize the area. Blackland Prairie soils once supported a tallgrass prairie dominated by tall-growing grasses such as big bluestem, little bluestem, indiangrass, and switchgrass. Because of the fertile soils, much of the original prairie has been plowed to produce food and forage crops. These plants have been identified as particularly worrisome terrestrial invasive species in the Blackland Prairies ecoregion. Click on their scientific names to go to the Invasive Plant Database and learn more.